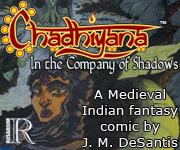 Last week, page twenty of Chadhiyana: In the Company of Shadows was published, and so the Prologue of the book was brought to a close. Though originally the title page for Chapter I had been scheduled for today, the author has chosen to delay the publication of Chapter I until the New Year begins (specifically starting on Tuesday, January 7, 2014, as the new-page-on-Tuesdays schedule will continue in the new year). J. M. DeSantis apologises for any disappointment this may cause for his readers, however, there is much to look forward to in the coming year. New characters, an explanation of the strange events of the Prologue and dialogue will begin with this upcoming first chapter. 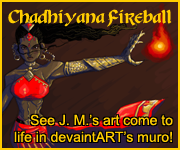 In the meanwhile, a small update (page corrections) will be made next week as J. M. gets Chadhiyana ready for the New Year and the next chapter of the book. Stay tuned, and enjoy the holidays!